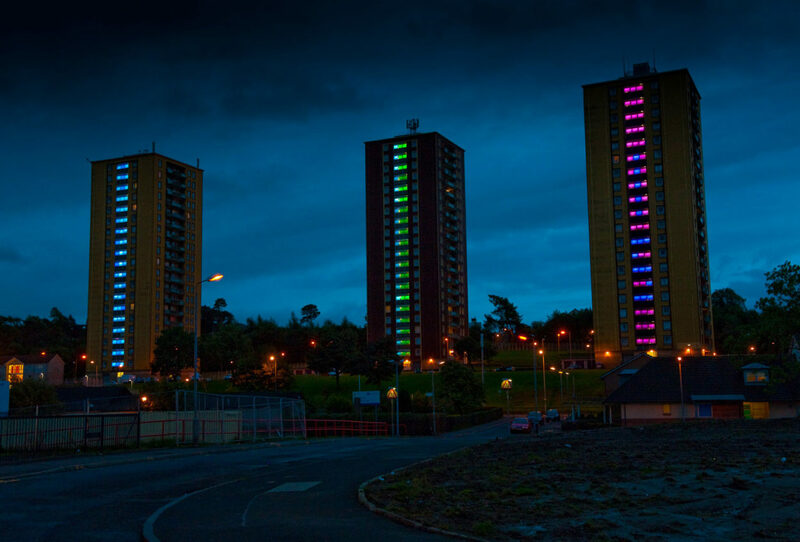 As part of the ongoing regeneration of Castlemilk, three tower blocks have been installed with LED battens, individually programmed to display the current weather forecast. 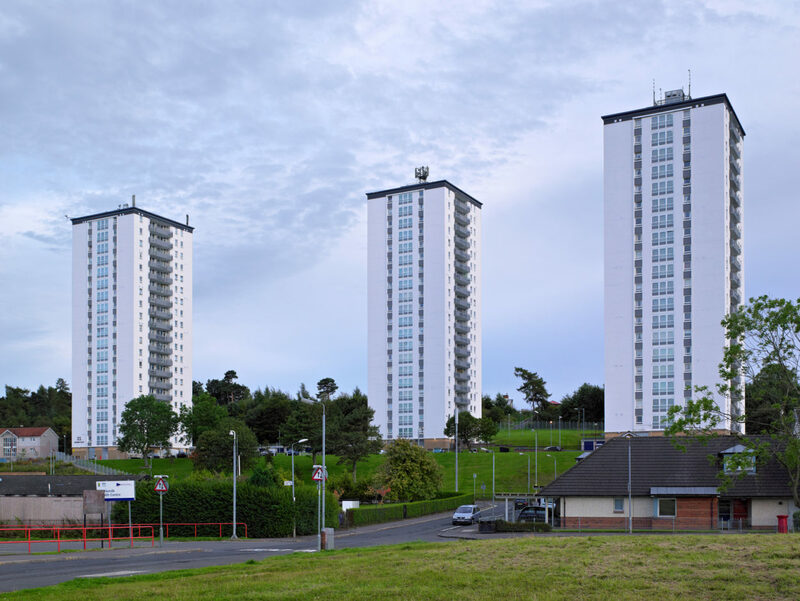 This has created a colourful landmark on Glasgow’s skyline, visible from across the city. 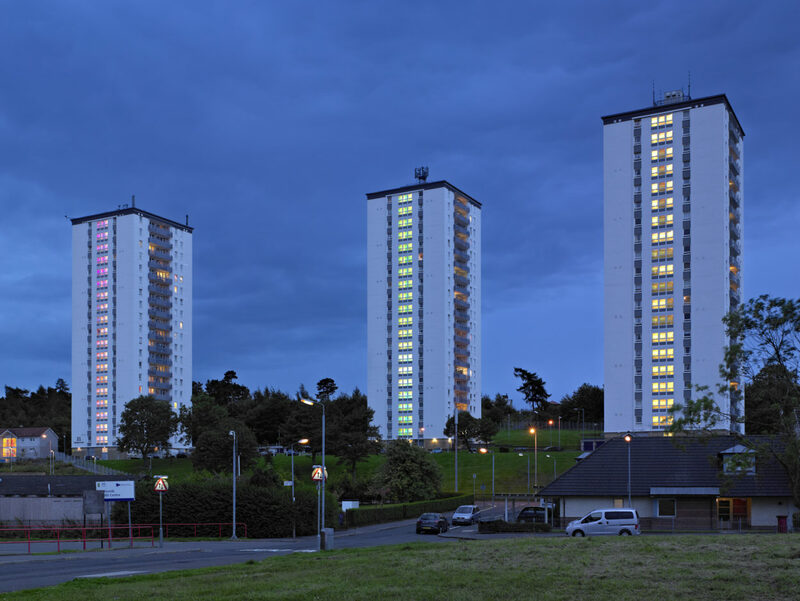 LED battens fitted on each floor of the three twenty storey high rises, illuminate the stairwell windows between dusk and dawn to create a wide range of patterns and effects. The three blocks each represent a different element of the weather; temperature, wind direction and weather outlook. The concept of reflecting local weather conditions evolved within community workshops, and key to the project was turning the residents ideas in reality. The first of the three high rise blocks displays the weather outlook via a range of patterns representing sun, cloud, rain, snow, fog, lighting and everything in between. Wind direction is represented on the second high rise with ripples of light passing over the front of the block in the corresponding compass direction. The final block displays the forecast temperature in figures, with the LED colour scheme moving through the spectrum from blue to warm orangey red, dependent on how high or low the forecast temperature is.